I’m assuming 80’s but I don’t think any other decade will take credit for those hearts. My booth is stocked as far as furniture goes for now, but it is really low on the smalls. 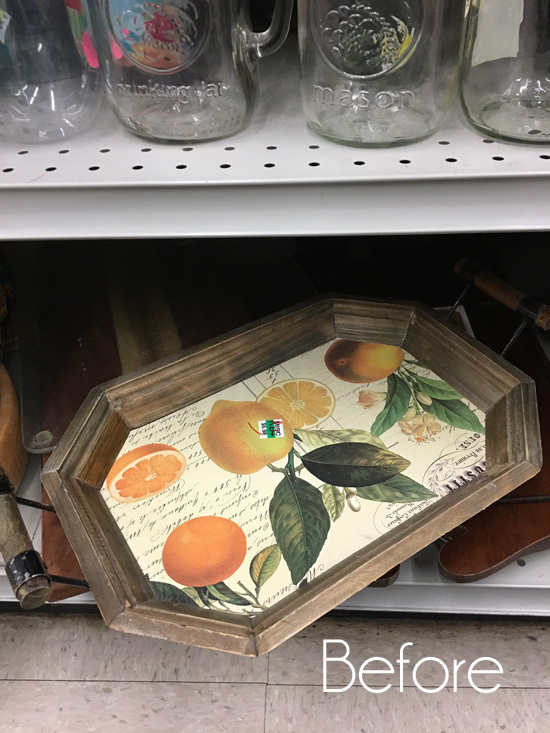 I stopped by a couple of thrift shops on Friday while I was out to see if I could find a few small things to update quickly, and this is one of the things I found. I think it was pricey at $4.98, but that’s just me being cheap. I’m including a few affiliate links so you can find the products I use. 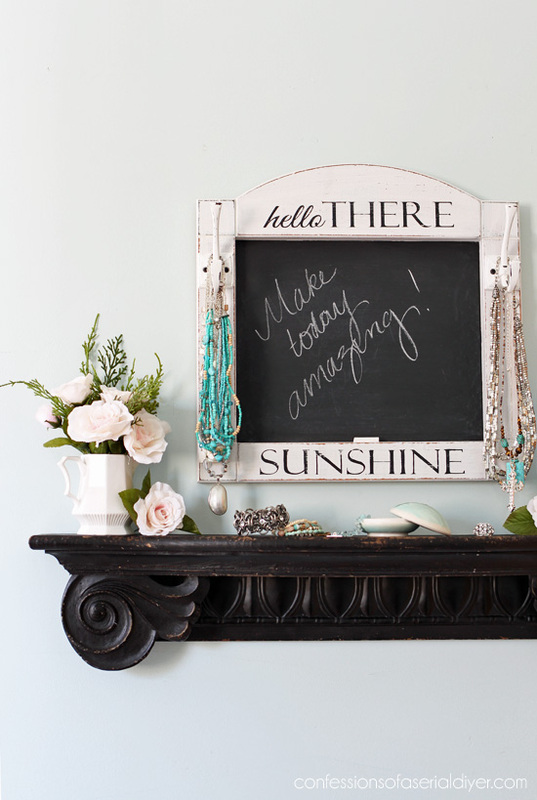 …with paint, hooks and some fun words! Goodbye 1985! See how to print your own designs with your Silhouette HERE. 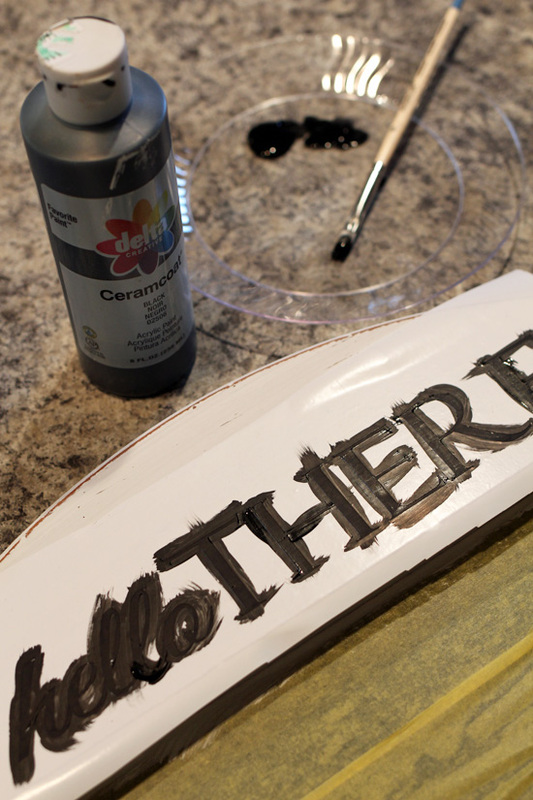 Then I very lightly sanded across the letters, and sealed with Annie Sloan’s clear soft wax. These were a bronze color. I spray painted them black, then white. HERE are the exact ones I used. I bought them a long time ago for another project but never used them. 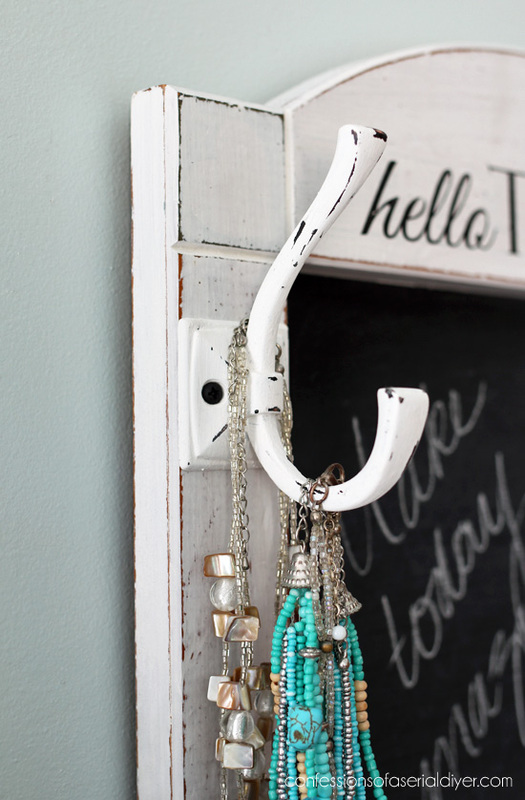 I used this fun piece to hang necklaces, but it would be even better by the door to hang keys or leashes. I borrowed that shelf from the wall going to my garage. I found it years ago at HomeGoods, and forgot how cute it is. You might remember the flowers from my dining room hutch. I love that this had a place to put the chalk. 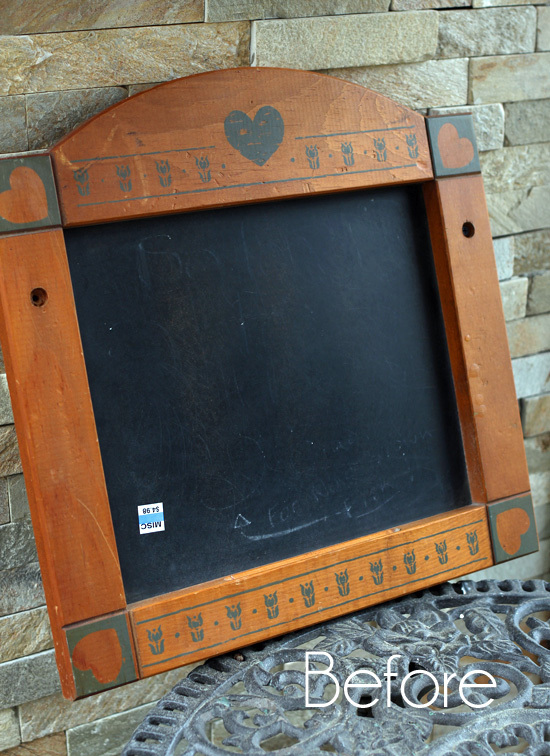 I taped off the frame and sprayed the chalkboard part with a fresh coat of Rustoleum Chalkboard Spray Paint. UPDATE: Check out how I updated this little tray HERE now! I thought that I was the only one that had projects that went astray. 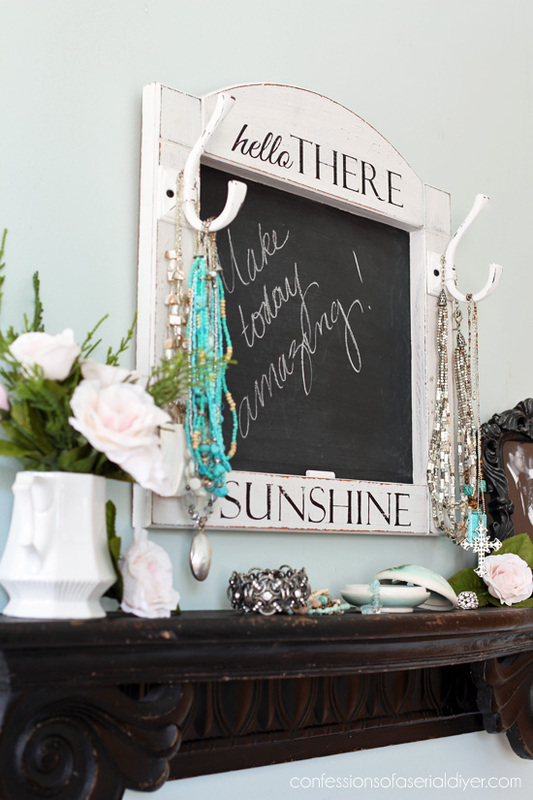 I love the chalk board you sent in its place, very cute. I always look forward to your post, you could never disappoint. I’m never disappointed Christy. Love the chalkboard and I’m sure we will see the suitcase soon. Plans change in our lives and we just have to deal with them. Looking forward to Thursday to see what you do with the tray. Christy, this is super cute and fun-ctional. 🙂 Love the color and hooks are brilliant. What kind of hanging device(s) did you use? I just love seeing what you do with your “finds”. Great job on the chalkboard! Hi Christy. What a cute transformation!!! I love it!! Can’t wait to see what you did with the tray. 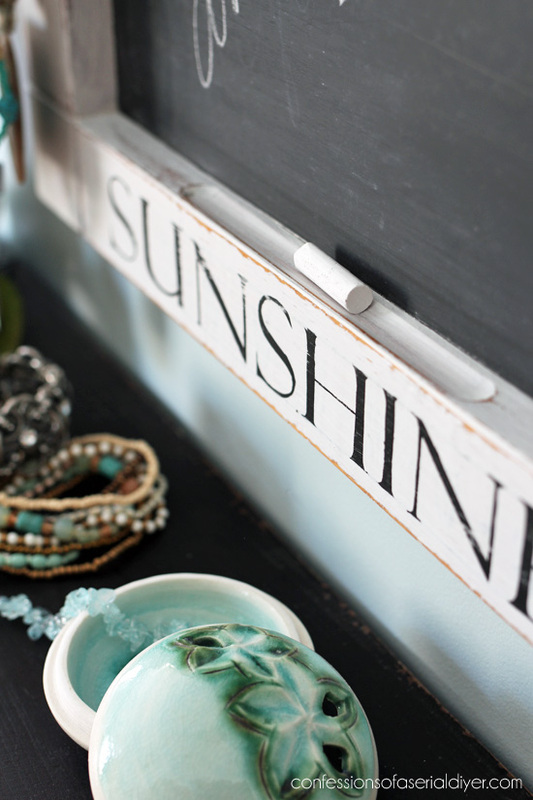 I love trays and use them a lot in my home. Have a great day. Love a good thrift store find! And you, my dear, gave it some much needed love. It’s so pretty! $5? I would have laughed had I seen that. And kept walking. Of course, something that everyone else walked away from became something magnificent after you had your way with it, Christy. You’re going to need some more smalls, because this isn’t going to last long in the booth. Beautiful and functional! There’s that dang silhouette machine (that I still don’t have) put to good use again. Very nice refresh and like how you added functional hooks. 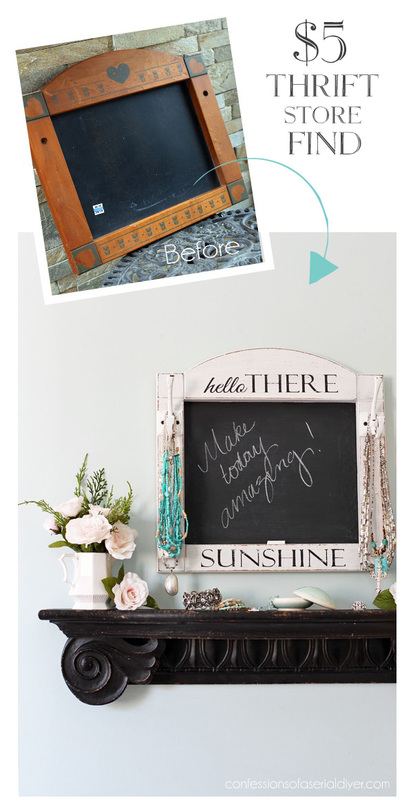 I did not know Rustoleum made chalkboard spray paint (finger’s crossed it’s available here in Canada) because it’s just been added to the top of my shopping list. 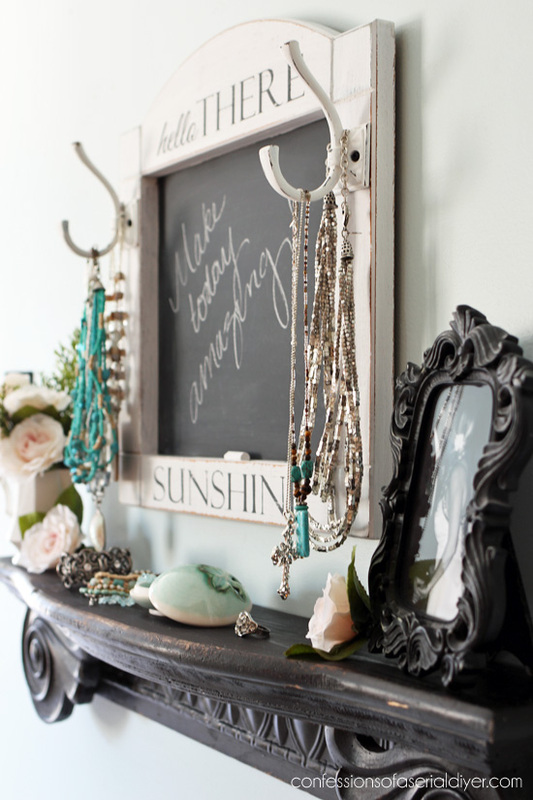 It’s amazing how paint and creativity can take something you would never display in your house and make it adorable. This came out adorable. You make magic every time. And you don’t have to worry about disappointing us…not even possible. Looking forward to the suitcase though. Awesome Christy! That is just like I like to do it 🙂 Great makeover! See… no skipping on your posts! (see my comment on the booth update post). 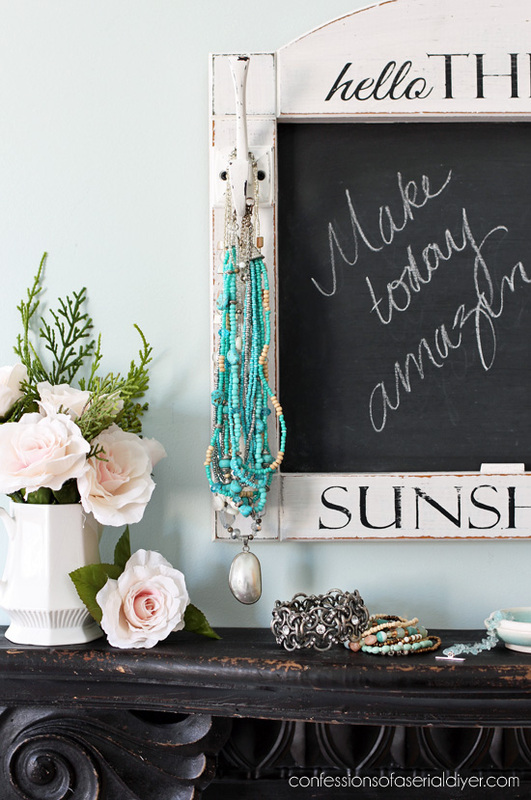 This chalkboard is SUPER cute! Love your blog and ideas. Where do you buy the Annie Sloan clear wax? Thank you, Nita! 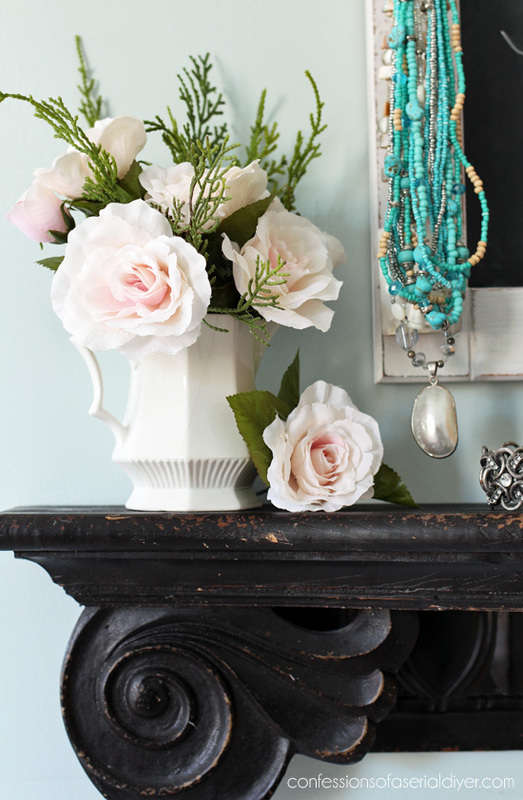 I buy my Annie Sloan supplies at a local retailer, but you can find a retailer near you here: https://www.anniesloan.com/stockists#/ There are also retailers that ship if you prefer to buy online. Hope this helps!